Integrify Administrators can define themselves or other users with 'Monitor' permissions of any given process. This capability will allow users to monitor all request activity for the given process or processes that they have been given monitor permissions for. First, select 'Monitor Requests' from your left-side Navigation pane. This will display a new tab called 'Monitored Requests'. 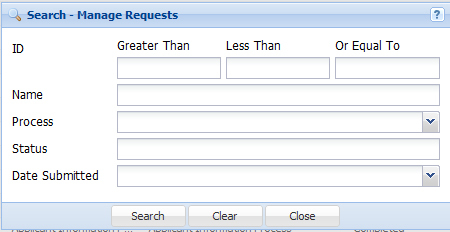 In this example, we show a filter that renders just the request activity for a 'Background Check Process'. You can then drill into a certain request by selecting the view icon next to the request you want to monitor.